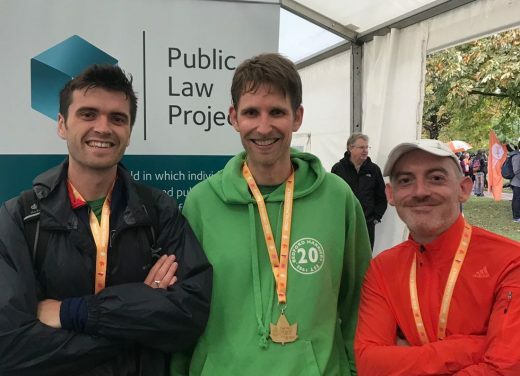 On the morning of Sunday 14th of October, Wilson’s runners Tim, Russell, and Sam braved the cold and rain to run the Royal Parks Half Marathon. They joined a team comprised of legal professionals from across the country, running to raise money for the Public Law Project. Our runners continued their fundraising efforts on Tuesday night, hosting a (very challenging) pub quiz at The Beehive in Tottenham. The event was a great success with over forty attendees and delegations from PLP, Bail for Immigration Detainees, One Pump Court, and Garden Court Chambers. We would like to thank all of those who participated and donated to this very worthy cause. The Public Law Project is a London-based legal charity that undertakes research, policy initiatives, casework and training across the range of public law remedies. Through this work, they aim to promote the Rule of Law, ensure fair systems, and improve access to justice. One of the charity’s noteworthy accomplishments is their Legal Aid Support Project. Now in its fifth year, the project aims to mitigate, where possible and appropriate, the impact that LASPO has had on access to justice. Since its inception, PLP’s lawyers have helped people to access legal aid, and brought strategic legal challenges to defend, and in some cases even improve access to justice. They also made a major submission to the Ministry of Justice’s Post Implementation Review of LASPO at the end of September 2018.